Combat Weapon Storage Systems provides free, no obligation armory consulting services featuring our exclusive, modular weapon storage systems, NVG Cabinets, Compact Storage, Weapon Tracking, Weapon Carts, Armory Cages, Workbenches, Weapons Vises, Shelving Systems, Modular Storage Cabinets and other affiliated storage systems required in armories. 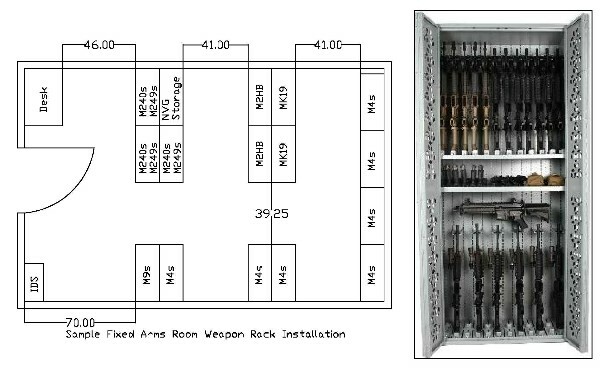 With changing weapon inventories across the branches of military and local government agencies, Combat Weapon Storage offers a complete modular based weapon storage system with our fully slotted back panel system allowing for configurations to be changed according to your inventory. Combat Weapon Storage specializes in the design & implementation of high density weapon storage resulting in maximum storage density inside your armory with free-standing Combat Weapon Racks or Combat Weapon Shelving and also mobile carriage systems for larger storage density requirements. With weapons being configured stored vertically and laterally, sight counts and inventory time is reduced for armorers including the ability to perform audits with Combat Universal Weapon Tracking Software. Miscellaneous items such as scopes, optics, NODs, tripods, spare barrel bags, NVGs, radios, ammo and tools are stored with standard components. Combat Weapon Storage Systems has implemented our exclusive line of weapon storage systems to all branches of the military in CONUS, Hawaii & Alaska and globally in Europe, Africa, Asia & South America. 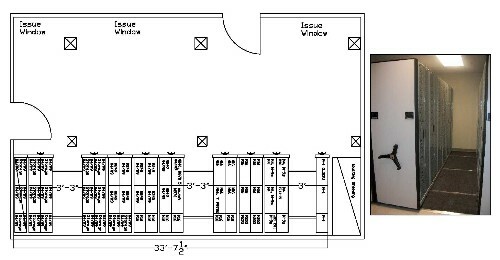 Our background as storage system experts allows our system designers to implement cost effective high density storage solutions meeting your changing inventory requirements.